The early adopters of social listening and analytics, who first saw its value, were all communications specialists and early pioneers in digital marketing. But almost overnight, the sector exploded and went mainstream, across management silos in enterprises large and small, traditional and new. The birth of the digital native confronted corporates with a new set of challenges—and opportunities . Today, it is more important than ever to harness the power of technological advancements in a way that empowers companies to easily create actionable intelligence from a large volume of complex social data. The sector is quickly becoming more sophisticated in the way it analyzes, collates, and presents data. Just as clients are becoming more astute about what we can do for them, so they become more data dependent, and more demanding. The days of tracking how many times a client has been mentioned online are long gone. We are in a new phase, partly thanks to our own innovation. Analysis, context, distribution, and ease of understanding, in whatever language, are the new drivers. None of this would be possible without significant technological leaps. For us at Talkwalker, data integrity comes from understanding our customers‘ needs and the sector’s direction of travel. In a global market, we analyze 187 languages, filter conversations 50 ways, and access historical data which we categorize and curate. We have pioneered fast and efficient reporting, customizing dashboards for clients that can be applied across teams and delivered by email. That’s how we provide the framework in which our clients can depend and act on the intelligence we provide. The foundations on which we combine other data streams from CRM and Relationship and Customer Insights teams enable them to build unprecedented 360 degree understanding of their customers. The term “big data” often invites more questions than it answers, because if you’re not an actuary, chances are you’re going to be intimidated by a tsunami of statistics. A good starting point is found in simplicity. Data fears fall away when you can click on a tab and find an answer, or when you unearth nuggets of gold, which lead you to unearth more of your own volition. We are liked as much as we are respected because of the ease of use of the platforms we design—platforms that can be customized, accessed, integrated, or shared across an enterprise. It makes everyone’s life simpler. We inform our platform with the views of our customers every day, making its evolution a shared experience. Why Is It So Important for Businesses to Pay Attention to Social Data? People post their emotions, thoughts, and opinions. In the globalized village, social media is Earth’s biggest focus group. We slice and dice it, giving unprecedented levels of insight that directly affect company strategy. I mentioned the Bank of England, whose Director of Strategy we recently interviewed. The BoE understands the time lag that sits between what people say they think and how those thoughts are interpreted by financial analysts. Social media analysis cuts to the chase, spotlighting trends in real time. The Bank no longer has to rely on third party interpretation to understand public opinion. Along with speed comes integration. The information tsunami comes in all shapes and sizes from multiple channels, so the ability to integrate data is invaluable to a modern enterprise whose decisions depend on its public’s opinions. The whole is greater than the sum of the parts, as they say. Never was a holistic understanding of the individual, let alone the collective customer base, as attainable as it is now. 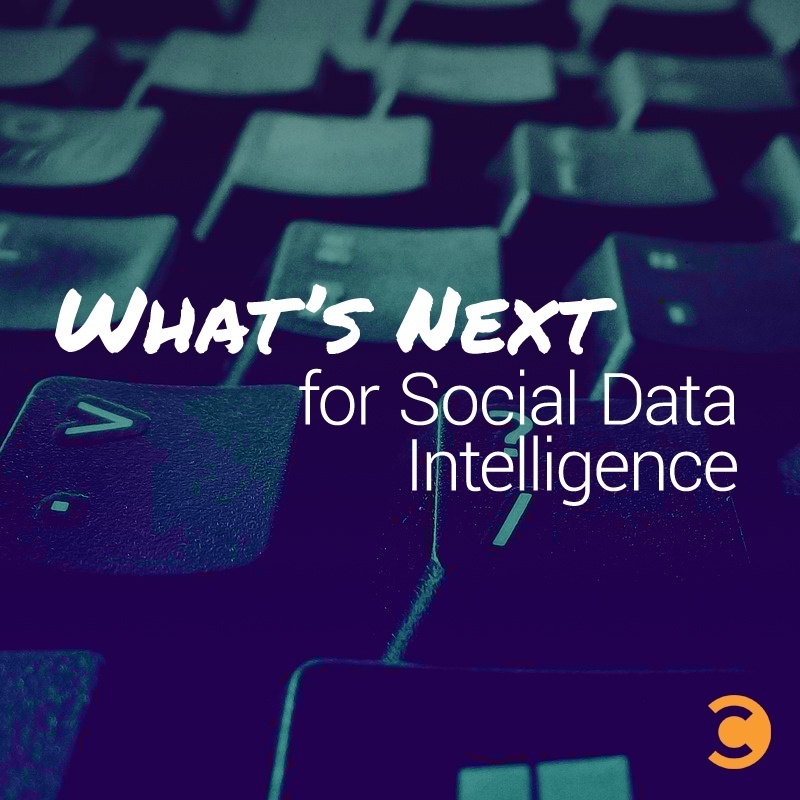 From its roots in the branding and comms sectors, social data is blossoming across sectors, informing customer engagement strategies one day, providing predictive analysis the next. Marketers are able to benchmark existing and bygone campaigns for engagement and cost effectiveness, as well as competitive action. Market researchers are spotlighting trends and directing corporate activity quickly and accordingly. Pioneers in this space are building emotion filters that dig beneath the social conversation to enable businesses of all shapes and sizes to fine tune their marketing and product strategy. I would say that the most dynamic and impactful development is the ability of customers to spread the intelligence we provide across departments. Knowledge is power, and when it is shared successfully across a company, it can be transformative. Not so long ago, social data did not exist. Today, no self-respecting enterprise would act without it. There are no precedents for the pioneering that is taking place in such a thoroughly dynamic sector as ours, and the future will see some big strides. Our ability to automatically decipher meaning and emotion from text, for instance, is a huge issue at present, given the variety of ways in which people express themselves. Companies will be able to use social intelligence analytics to understand and engage with the individual, not just the group. Companies will outwit each other based on their speed of analysis and response. Data will increase in volume, and software will have to cope, while platforms will have to become all the more able to simplify analysis while becoming all the more robust. Technology will give way from tracking and analysis towards more sophisticated integration that makes everybody in the corporate supply chain their own analyst. Comprehensive social listening, deep analytics, fast and efficient reporting, an intuitive user interface, the ability to integrate using an API, or just the ability to easily export data will be key. Most importantly, social data intelligence will bind the disparate silos within an enterprise into a unified and coordinated powerhouse, based on new dimensions of customer understanding, internal communication and coordination. Julie Hong is a Community Manager at Talkwalker. She's a social media, web tech, and advertising enthusiast who loves to share insightful digital trends and analyses in Talkwalker's blog. Julie is also a lover of all things cinematic.